Pity the Bathtub Its Forced Embrace of the Human Form (buy). “Show, don’t tell” serves as the general rallying cry for poetry, that which distinguishes itself from prose by using the best words in the best order with minimal reader hand-holding. Reading poetry is how people discover they are self-realized readers, able to reach and accept their own understandings and lack there of for what they are, interpretation, and stand confidently behind those thoughts. Poetry, though, is tricky in that it is one of the few writing forms that constantly seeks to renew itself in the name of originality. The standard of poetry has changed much across chronology as well as geography. From lyrics and soothsayers to free verse and cubists, poetry has always strived to make something more out of form (or lack thereof) than what came before. This constant reinvention can make for some pretty high hurdles for casual adventurers in reading. 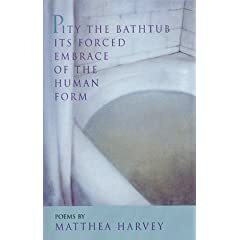 Matthea Harvey’s “Pity the Bathtub Its Forced Embrace of the Human Form,” is one such hurdle – a book so dense and intentionally/intelligently misguiding that it forces a need for concentration upon the reader. This is no casual read. This is poetry at a pinnacle, and Matthea Harvey issues with it an invitation to dig into the words the way only this particular art from can make at once challenging and rewarding through technique as well as the words themselves. There is no better example of this, I believe, than In Defense of Our Overgrown Garden, which employs (although to lesser degree than most other poems in the collection) a line-wrapping technique which sporadically links two consecutive lines via one or a few words. This is not so much a run-on as it is a slap in the face performed to bring a reader crazed with linear thought back to making sense out of the mosaic scene that is poetry. When the reader ventures too far with one particular thought, he/she will run over meaning like so much a highway headlight-lit possum. The construction of these lines demand patience and thought from the reader, not only in where individual thought start/stop but also how the images within said lines are linked and, of course, why. I would not be so enthralled with Ms. Harvey’s poems if they were built on structure alone. I love her words for the exact same reason I love e e cummings’ poems: the ability to create/use images with the most ordinary words to say something profoundly affective in an entirely original and beautiful way. As an example of this, I offer you the following poem from “Pity the Bathtub…” that immediately hooks the reader with image, then wordplay, then employs some of the above-mentioned line wrapping technique. There are also “traditional” poems in this collection (i.e. those with punctuation), and if a reader is not in a particularly sit-and-ponder sort of mood, those poems might feel at first, as they did to me, a piece of driftwood to a person swept out to sea and sick of treading. As with most poetry reading, effort spent is usually effort returned. Harvey makes this process all but effortless by reducing the concentration needed to know what she’s getting at down to figuring out how her sentences are constructed. After the general method of the lines’ interactions is discovered, the poems’ natural rhythms and content are offered up as praise for taking the time needed to find them. Far from a casual read, and definitely not for those who don’t like thinking (although it is poetry, so that should go unsaid), this book is a great distraction from the likes of the easy-listening postmodern narrative and autobiographical free verse so rampant in pages today that tend to let readers off the proverbial hook by being, in my opinion, a little too immediately accessible. The reward for hard work is great gain, and anyone truly reading the poems in this book will benefit much from the time and effort spent.